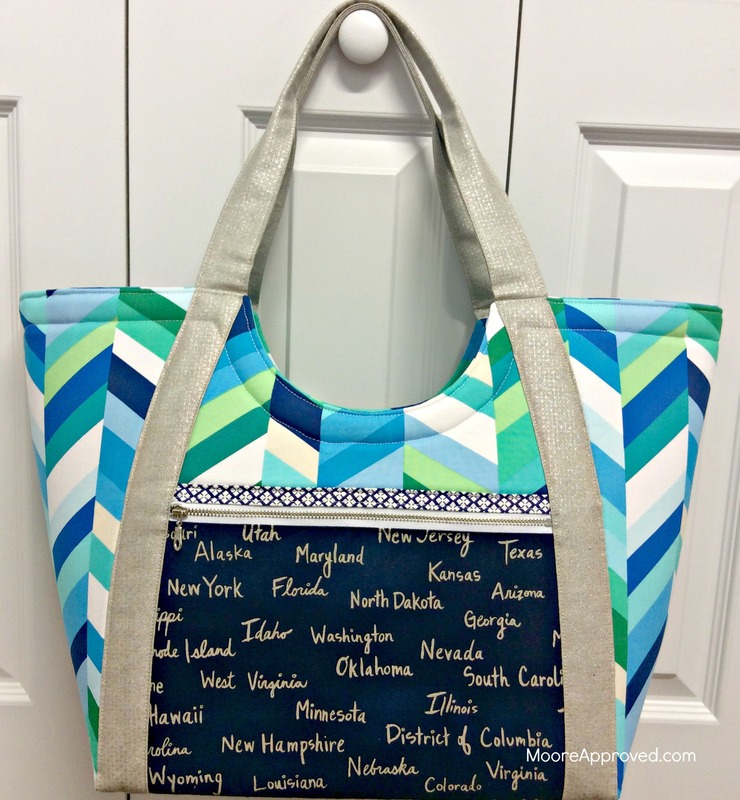 Just finished making my first Poolside Tote by Anna Graham of Noodlehead. The PDF pattern is available in the online shop for $9, but I was lucky to pick this one up (along with the Super Tote) during a Black Friday weekend sale. I’ll come right out and say it: this tote bag is GINORMOUS – extremely roomy, and would be a great option for a travel bag. 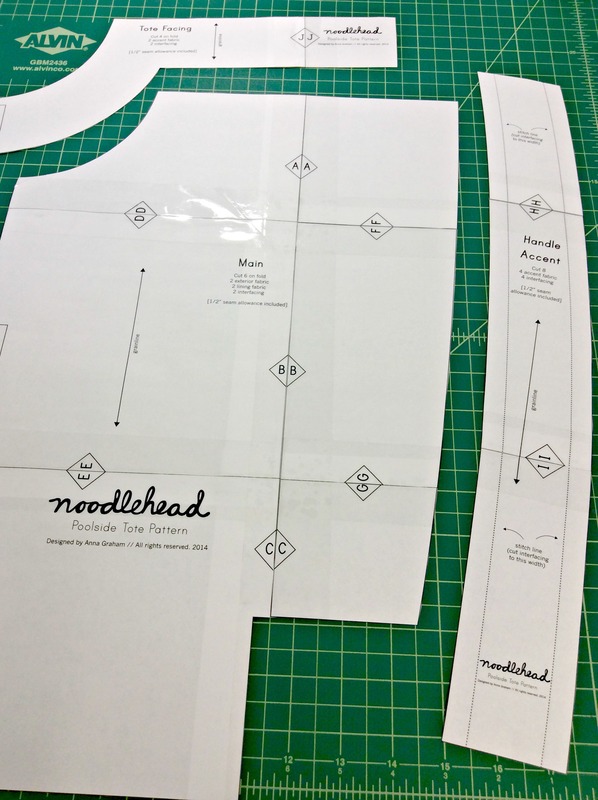 Noodlehead patterns are always customizable with several different options to really make a bag feel like “yours,” and the construction methods are rather clever. In this pattern, there’s a facing that’s attached to the top of the exterior, then it encases the lining – so NO TURNING REQUIRED! That’s right, you heard me – NO TURNING REQUIRED. As I’d mentioned in my previous post, I had a bit of a lightning strike moment with attaching pattern pieces after printing them out. It involves using Elmer’s Washable School Glue and clear plastic packing tape. While making bags, I’ve been keeping track of the time spent on each project. It’s kind of mind blowing to do this, as I’ve been known to clock in 30 hours on just one bag. 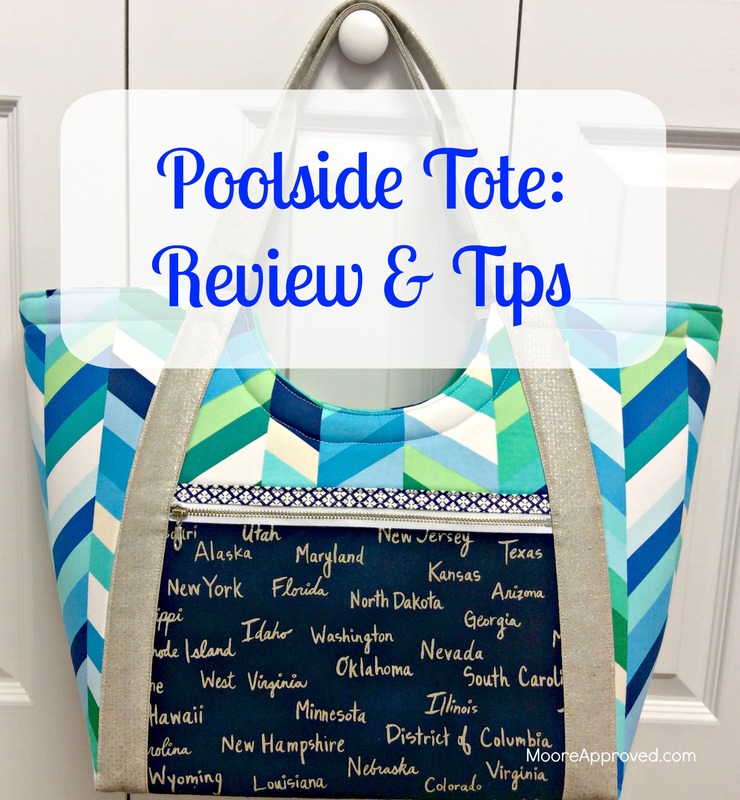 The Poolside Tote was one of my “speedier” sews – and by that, I mean a total running time of 13.25 hours. Less than half of this was actual sewing time – there’s heavy duty prep work here! 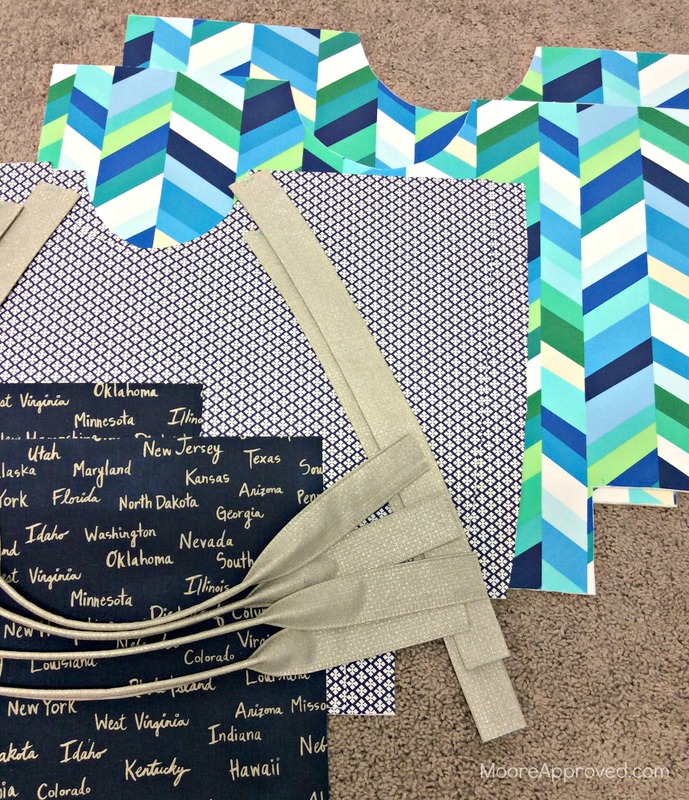 This calculation includes cutting out and taping together the pattern pieces – a one time experience. Comically, I also realized late into the process that I’d made four handles when the pattern only requires two. Lol! Guess this means I’ll have two ready made for another bag, although they are rather short. For my fabrics, I chose Robert Kaufman Geo Pop canvas in a blue/green herringbone print, Cotton + Steel canvas in both navy and sparkly silver, and a navy/white small print I got during a Fabric.com Cyber Monday sale last year for $1.99 per yard. Did I mention this is a great stash busting pattern? Instead of batting, I used Pellon 1-sided fusible Flex-Foam stabilizer with the Geo Pop canvas. 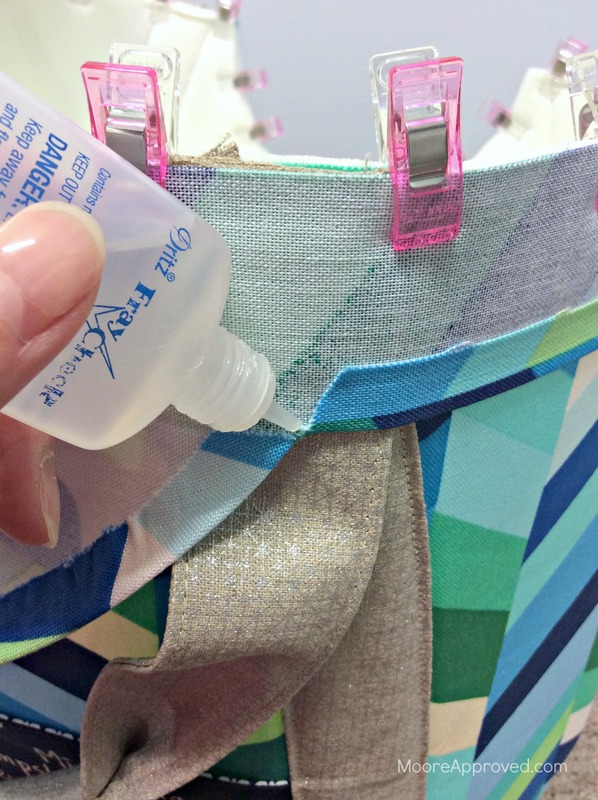 (Review on this product available here) I can’t say enough good stuff about fusible Flex-Foam, it’s made my life so much easier when it comes to bag making. To fuse the Flex-Foam and interfacing to the exterior and lining pieces, I set the Flex-Foam/interfacing with the adhesive side up, then placed the pieces wrong side down on top. I busted out the iron and fused as much as I could without touching the bare adhesive. Then I cut right at the pattern piece edges so the Flex-Foam/interfacing mirrored that shape. 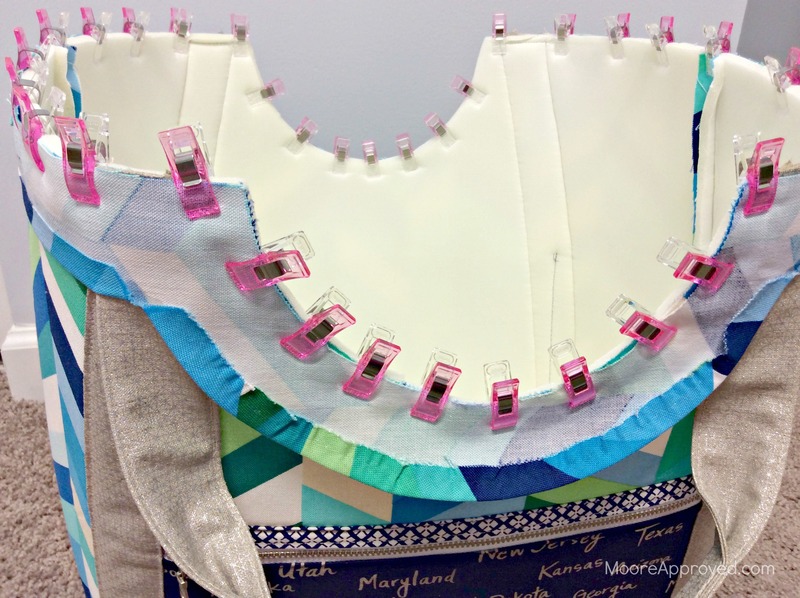 Sure beats tracing the pattern on to the interfacing and Flex-Foam – definitely a time saver! One of the reasons I chose canvas for the handles is so I could skip using interfacing altogether. Part of the process involves running basting stitches on the handle connectors and facing in order to turn the raw edges under. I was not prepared for how much time I ended up devoting to removing all the basting stitches – easily 30-45 minutes. On the curve of the facing piece, the instructions call for snipping an inside corner. At this spot, the raw edge of the fabric is basically exposed. I preemptively dabbed some Dritz Fray Check on all four of these points. For my hanging swivel clip, I found a twill ribbon from a Rowan fat quarter bundle that I recycled. Due to using a foam stabilizer for the exterior, the instructions suggest that you use a larger seam allowance for the lining to make up for the bulk of the exterior (sewn with a 1/2 inch seam allowance). I used a 5/8 inch seam allowance for the lining, but noticed it was still too tall to fit into the facing. To compensate, I trimmed about one inch off the entire top perimeter of the lining fabric. 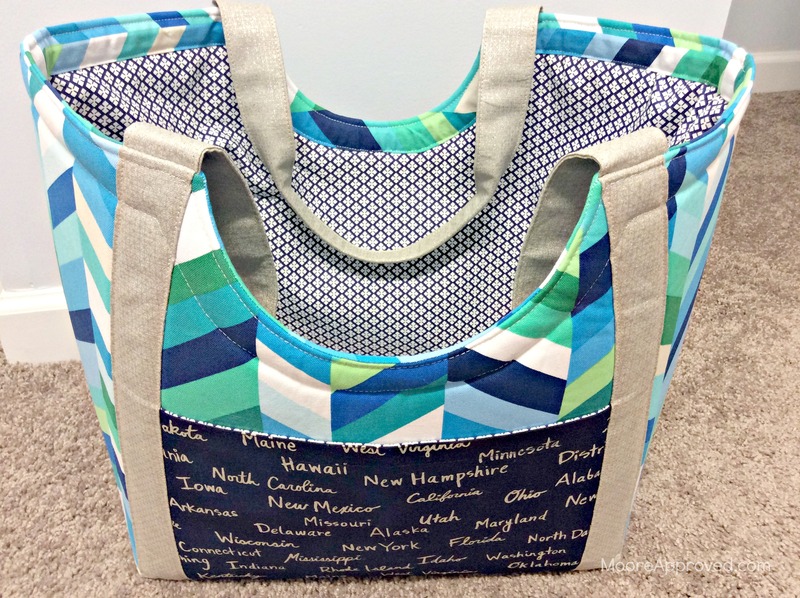 I selected to do the zippered pocket for the front, and a slip pocket for the back of this Poolside Tote. Interestingly, I did not use even a single pin for this sewing project. Clover Wonder Clips were used instead, and they worked great for holding the facing to the exterior before sewing them together. By far the most difficult steps for this pattern were at the very end: 1) flipping over the facing and 2) top stitching the facing closed. This likely would have gone smoother had I not used a foam stabilizer, but I prefer how much shape it gives the tote. I practically had to wrestle with the facing to keep it in place – the larger Clover Wonder Clips (below, right) did help some, but it was very challenging nonetheless. To top stitch and attach the facing on the flip side, I used my Janome 7700’s built in walking foot. This was not super fun, and I struggled quite a bit. I’m not thrilled with the way my top stitching and edge stitching looks. Because I chose a print with contrasting colors for the main fabric, I wasn’t able to choose a thread that totally blended in. That’s my usual method of camouflaging my stitches. With the exception of my lackluster top stitching, I love the silhouette of this bag and the end result. If I had to rate this pattern on the level of difficulty, I’d give it a 4/10.